New 3-D printed robotic structures can squeeze in tight spaces like a crack in the wall of a cave, jump over trip wire or crawl under a vehicle—all complex Army-relevant functions impossible for humans to perform safely. Investigators at the Army's Institute for Soldier Nanotechnologies (ISN), located at MIT, have developed a 3-D printing platform that can enable both the modeling and design of complex magnetically actuated devices. 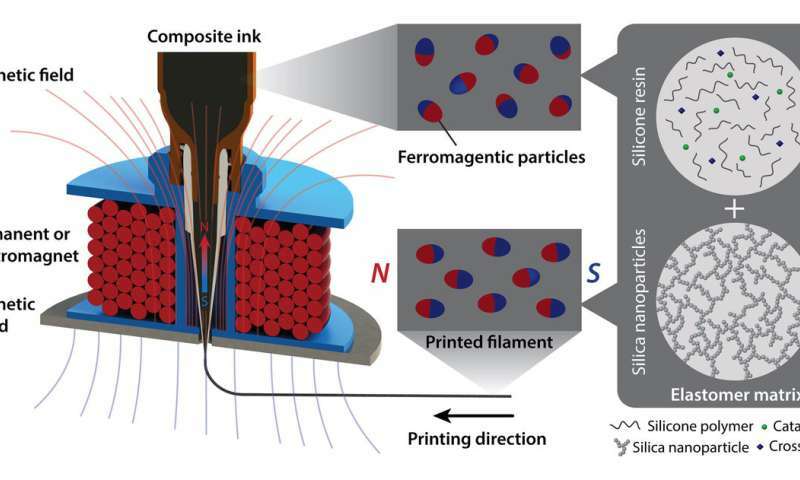 The new approach utilizes a 3-D printing platform fitted with an electromagnet nozzle and a new type of 3-D printable ink infused with magnetic particles. 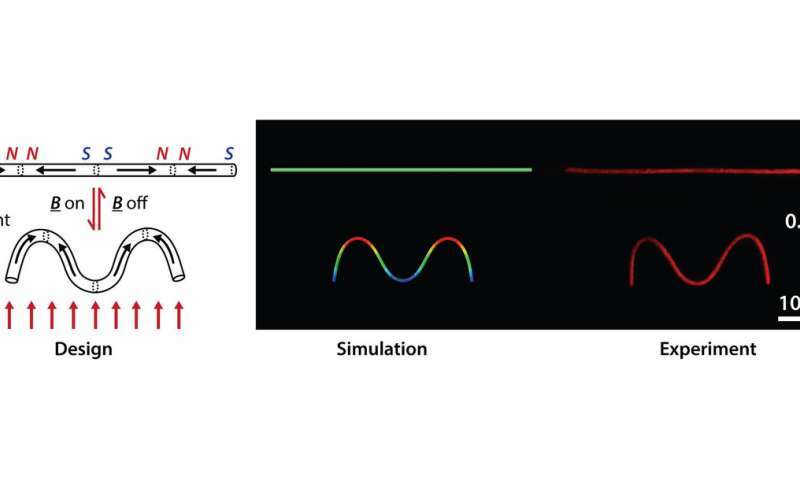 Their findings could lead to new biomedical applications, magnetic ink optimized to strengthen soft robotic functionality, and new on-demand flexible material systems for integration into Soldier systems. "This research provided new insight on ways to cause fast changes in 3-dimensional shapes of parts such as robot's limbs. The MIT group demonstrated this success using auxetic metamaterials—synthetic composite materials that have an unusual internal structure and the unusual property that when exposed to external magnetic actuation, they shrank in both longitudinal and transverse directions. This is different from typical auxetic materials that do require direct mechanical contact, and when compressed they undergo contraction in the directions perpendicular to the applied force (this is called the negative Poisson's ratio). On the contrary, common materials expand in the directions orthogonal to compressive load. In one example from this research, through remote magnetic control, they caused a metamaterial structure to jump forward 120 mm within 0.7 s, which is very fast for the current state of the art. This jump was due to a rapid release of elastic and magnetic potential energy stored in that structure. 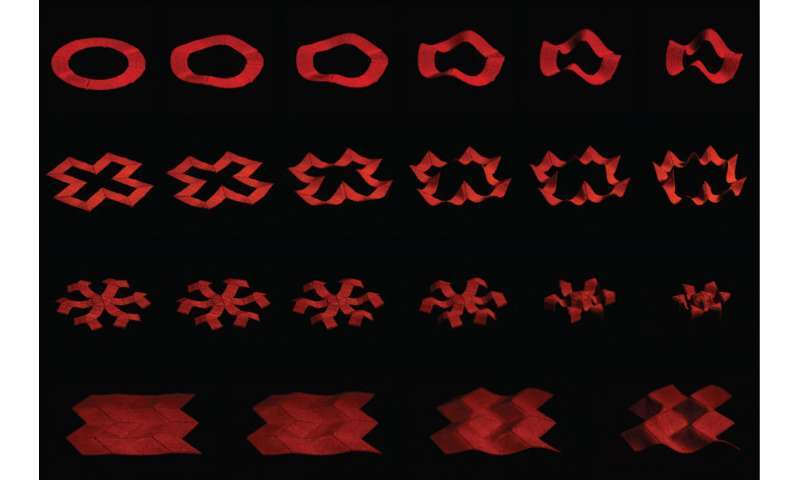 Such complex shape-morphing structures could have great potential for the Army, because they may help create soft robots—robots with pliable limbs similar to natural organisms. Compared to the current generation of rigid robots, soft robots could move much more dexterously on a complex battlefield terrain," said Army Research Laboratory Dr. Alex Hsieh.